Surata Istana of Krontjong Minstrels led by George De Fretes (repeat). De Fretes was born in Bandung on 23 December 1923, later went to Batavia (Jakarta now) and developed himself to one of the best, if not thé best Hawaiian guitar player in the world. This happened under influence of the good reception in Indonesia of radio programmes from America, where the most famous pioneers of the Hawaiian guitar and Hawaiian music in general had their weekly programmes. They were people such as Sol Hoopi’i, Andy Iona, David Keli’i and many others who managed to carry their American audience with their marvellous instruments. And for a long time at that. In this way, multiple Indonesians were captivated by this beautiful music, which resulted in a number of well-known Hawaiian guitarists like Rudi Wairata, Coy Pereira, Victor Spangenberg and Theo Ehrlicher. These last two were already known in the Netherlands after the war. But the De Fretes’ family stood out especially; the whole family had a feel for music and were very ‘Hawaiian-minded’. Brothers Anton, Arie, John and Peter – all of them could play. Until recently we have been able to enjoy the works of the youngest, Peter de Fretes. He competed with his ‘elder brother’, but excelled during a time that record companies were no longer very interested. Strange really, seeing as the rereleases of all that old material are still being sold well. These boys really ‘wrote history’ in a way. In the war (against Japan), the name of the ‘Royal Hawaiian Quintet’ (later ‘Minstrels’) had to be changed to ‘Suara Istana’ (Voices from the Palace), and the repertoire also had to be changed. That was no big deal for the Indian virtuoso musicians, it simply became ‘krontjong’. Because of his Dutch disposition, George de Fretes and really the whole family, had to move to the Netherlands. Illegally, yes, but George had already secured a contract before he reached the Dutch shores. After a short internment, The Royal Hawaiian Minstrels was founded with a ‘branch’ named Suara Istana. This happened mainly with the musicians that George had already worked with in Indonesia. Among them was his ex-wife Joyce Aubrey, who had already caused a furore in the Netherlands much earlier, as singer for the Mena Moeria Minstrels and Amboina Serenaders. Daughter Wanda was also pushed forward even though her mother forbade it. ‘I’ll break her legs’, she must have said once. But of course, blood will tell and Wanda even became an idol for a short while. Even though the George de Fretes and his Royal Hawaiian Minstrels phenomenon was breathtaking and very succesful in the Netherlands (1958), after only a few years the musical landscape had changed so much that it was no longer possible to live off of music alone. George de Fretes had to decide to go to America, first for a short while in 1964 but permanently in 1968, where this music still had a large following at the time. George de Fretes passed away under rather lonely circumstances in California on 19 November 1981. His dying wish was granted – he was buried next to his great idol and inspiration, the Hawaiian who made Hawaiian music popular all over the world: Sol Hoopi’i. We possess a wealth of recorded material on records, allowing us to let you hear the Indian (Krontjong) repertoire in this 2nd programme. 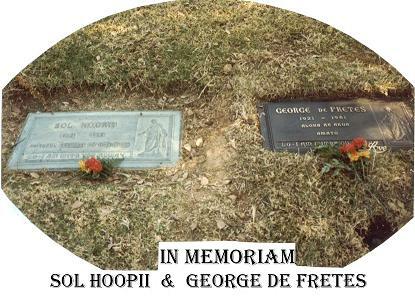 In the first picture you can see a compilation of various Krontjong (Indian) records from their heyday, and in the second picture the gravestones of Sol Hoopi’i and George de Fretes in Inglewood (California).